Hey all! I will be starting a new series on top of the wedding series to document my travel to korea! The reason for starting this is because while researching for my korea trip I realised the most valuable info are from fellow singaporeans who have been there and done that and came back to blog about it! 🙂 Heehee, so hopefully this post will help others who are intending to travel to Korea in the subsequent months! I am still in the midst of consolidating my photos so today’s post will be on the various data plans available! While preparing for my korea trip, I realised that data is quite expensive if you are travelling in a small group/solo (in this case, just 2 for us). This post will lay out the different ways you can get data in Seoul, Korea based on the research I have done. >3 pax: rent a wifi egg! 5 Ways to get Data in Seoul, Korea! 1. Rent a wifi egg! Most wifi eggs I saw only had a battery life of 5 hours or so, so you will still need to constantly charge it on the trip! Get it in Singapore before flying! cons: your time flying is counted in as well! Tip: Klook provides these wifi egg rentals as well and they tend to have alot of promo codes circulating around so getting from them might be cheaper too! 2. Buy a local (korea) sim card! Not that not all sim cards have local call ability, if you only need to use data and no need the call function, there is a specific sim card for it! I won’t link it here as I cannot verify the effectiveness of it in Seoul, but based on the product reviews, many people have used it and it works! 3. Subscribe to local (korea) wifi! If you want to use wifi but still do not want to risk incurring cost for the wifi egg damages and having to keep charging the wifi egg, good news! Seoul is like super connected! The wifi signals are found EVERYWHERE and it is full bar even in subways! KT olleh has a wifi subscription plan that is charged PER DAY of use which works very well for tourist! Look at this blogpost by Budget Travel for detailed instructions on how to use it! Cheaper than sim card as you pay only when you use! 4. Use Singapore roaming data plans! This was the option I used and I highly recommend it for small groups to use this! 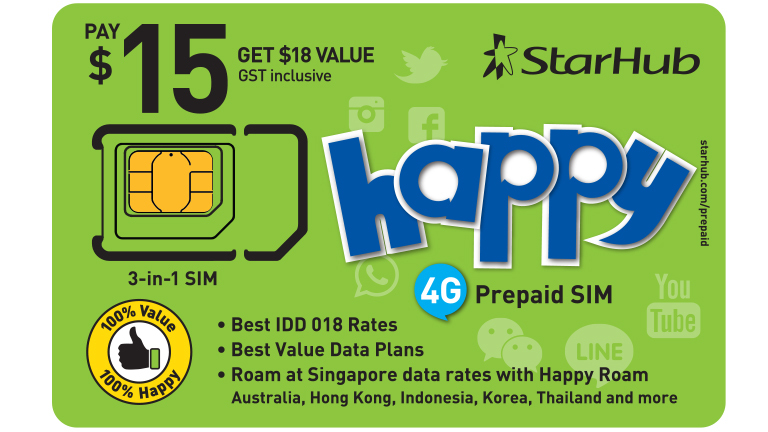 The one I used was from Starhub Happy Roam! Prepaid card and I give it 5 stars!!! Cost effective because I can purchase bits of data that last for a few days (eg. 1GB for 3 days) and choose to top up the data based on my usage! ie. if by Day 1 you are finishing up your 1 GB, you can purchase another GB at anytime through the Happy App! Note: although both of phones got good signals, if both of you are trying to load chrome pages, only the guy with the sim card will be able to do it. But simple things like whatsapp and FB feed is alright! Starhub website provides a very comprehensive step-by-step guide to use it as well! Leftover data can also be used at stopover locations like Hong Kong and other countries as long as it is still within you number of days! You activate your data roaming and purchase data plans based on 1 month validity usually in 1GB, 2GB, 3GB etc. Browse through the data roaming plans and choose the one most cost effective for you! My damage for 6 days in Korea/Hong Kong (stopover) was 10 dollars for 2 people! (2GB) which is very reasonable considering a wifi egg rental/sim card will already easily set us back way more than that!